Slowly, some cultural resource or historic preservation laws began to be passed after the Antiquities Act. Although these laws had major impacts on the practice of U.S. archeology, few dealt specifically with the care and management of archeological collections. 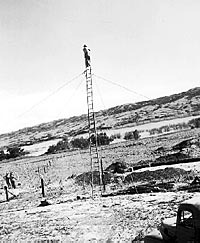 An extension ladder anchored with taut guy wires often provided a perch for taking near-vertical photographs of excavated house floors in the Missouri River basin. Photo taken in 1954 by H. Huscher. Photograph courtesy of the National Anthropological Archives, Smithsonian Institution. This Act declares it a federal policy to preserve historic and prehistoric areas of national significance and establishes the National Historic Landmarks program. It also empowers the Secretary of the Interior to "secure, collate, and preserve drawings, plans, photographs, and other data of historic and archeologic sites, buildings, and objects." Although these documents could be significant associated records of archeological projects, how and where they are to be curated is not adequately addressed in this law. The passage of the Historic Sites Act also formalizes National Park Service programs involved in salvage archeology, programs that were designed to put many people to work during the Great Depression. This Act authorized the Secretary of the Interior through the National Park Service to preserve the objects found in individual national parks and provide public access to those materials through museums. The Act, as amended in 1996, gives the NPS legal authority to "acquire collections through donations and purchase and to loan and and exchange collections. Under certain conditions, it also allows the deaccession of collections by transfer, conveyance, and destruction" (NPS 2000:A:1). In the latter case, only museum objects and collections that have no historic, cultural, scientific, educational, aesthetic, or monetary value can be destroyed. The Reservoir Salvage Act of 1960 is another important piece of legislation that directly affected salvage archeology programs. Such programs, which began during the Depression and continued in a revised form until after World War II, helped put many people to work, save many archeological sites, and create many new collections. The passage of this law was related to the widespread destruction of archeological sites from large scale construction, such as federal dams and highways. Unfortunately, the Act did not address the care and management of the large collections that resulted from salvage work. The Archaeological and Historic Preservation Act of 1974 (or the Moss-Bennett Act, or the Archaeological Data Preservation Act) continues the fight to preserve archeological resources during development, but it is broader in scope. The AHPA and its amendments call for the "preservation of historical and archeological data (including relics and specimens) which might otherwise be irreparably lost or destroyed as the result of … any federal construction project or federally licensed activity or program." Another significant stipulation is that up to 1% of the cost of a federal project could be used for "recovery, protection, and preservation of any data deemed endangered." AHPA is also the first piece of legislation since the Antiquities Act to mention the care of archeological collections. It states that the Secretary of the Interior must consult with appropriate groups or individuals "with a view to determining the ownership of and the most appropriate repository for any relics and specimens recovered as a result of any work performed...." Furthermore, it is the first call for the Secretary of the Interior to issue regulations for curation, which did not come about until 1990. Two other laws enacted in the 1960s had major impacts on American archeology, the National Historic Preservation Act (NHPA) of 1966, as amended, and the National Environmental Policy Act (NEPA) of 1969. The majority of today's contract or CRM archeology firms are involved in compliance with these two pieces of legislation. NHPA is responsible for expanding the National Register of Historic Places and establishing the State Historic Preservation Offices (SHPO). Archeologists deal most often with sections 106 and 110 of the Act. Section 106 requires federal agencies to "take into account" the effects of a federal or federally assisted undertaking in any state of the Union on "any district, site, building, structure or object that is included in or eligible for the National Register" before federal funding for the project is approved. Archeological sites may be significant because they "have yielded, or may be likely to yield, information important in prehistory or history." Section 110 calls for the preservation and use of any historic property owned or controlled by a federal agency. Determining eligibility and resolving adverse effects of federal actions on archeological resources under NHPA often involves several phases of archeological activity from scoping to surveying (Phase I) to testing to full excavation or mitigation ( Phase III). When testing and excavation are required, collections are usually made. Given the costs of curation and limitations on space for collections in repositories, there seems to be a trend to not collect material remains during surveys (Griset and Kodack 1999). Instead, associated documentation, particularly field notes, photographs, maps and digital data, are the results of such survey projects, which also require curation. The National Environmental Policy Act covers both cultural and natural resource management. It is an authority for managing the impacts of all federal actions on the "human environment." Cultural resources are collected under Section 101 (b)4, which gives the federal government responsibility to "preserve important historic, cultural, and natural aspects of our national heritage, and maintain, wherever possible, an environment which supports diversity, and variety of individual choice." Contract archeologists deal with NEPA by preparing either an Environmental Assessment (EA) or an Environmental Impact Statement (EIS) for a federal project. Archeological compliance and preparation of these statements usually involves scoping and/or surveying. NEPA is unique, though, in that it links together all socio-cultural impacts. Acknowledging the fact that impacts on archeological resources are not the only socio-cultural impacts a project may have, NEPA considers the relationships between past cultures and their living descendants. Archeological projects involved in NHPA or NEPA compliance have created vast amounts of archeological collections over the past 30 years. Since many projects were done before the curation standards and guidelines were issued in 1990, appropriate long-term collections care was occasionally set up by knowledgeable and responsible principal investigators. NHPA and NEPA projects are also known for producing archeological "gray literature." These are usually project or site reports that are limited in their accessibility and are sometimes limited in their research and interpretive value. NHPA is important in terms of records management, though, because it requires that "records and other data, including data produced by historical research and archeological surveys and excavations are permanently maintained in appropriate databases and made available to potential users" (Sec. 112).